Court hears Sheriff received £200K from law firm. DETAILS of a £200,000 payment made to a suspended Scottish judge have emerged in a court clash between liquidators of the collapsed £400m Heather Capital Hedge Fund & Glasgow based law firm Levy & Mcrae – who are being sued for £28.4million in relation to transfers of cash to offshore companies. In an opinion issued by Lord Woolman at the Court of Session, it was revealed suspended Sheriff Peter Black Watson (61) – a former partner in Levy & McRae - received £200,000 from the client account of Hassans – a Gibraltar based law firm on 23 December 2008. The payment to the suspended Sheriff came to light in court documents which also revealed a trail of cash transfers from Levy & Mcrae to offshore companies based in Panama, Monaco & Gibraltar. The court also heard Gibraltar based Hassans- acted in the transfer of funds to companies incorporated in Gibraltar that were owned or controlled by Gregory King – who launched Heather Capital in 2004. Liquidators of the now defunct hedge fund contend Heather Capital was defrauded of a sum of about £90 million. The court also heard claims Levy & McRae provided "dishonest assistance" to Heather Capital’s founder - Gregory King – now based in Spain. During the hearing, legal agents acting for the liquidators also sought to obtain an order requiring suspended Sheriff Watson to disclose his involvement with Heather Capital. However, Lord Woolman refused the request, expressing fears that granting the order would ‘encourage litigation’. Lord Woolman said in his opinion: "I decline to do so. The details of insurance are a private matter between the insured and insurers. There are major questions involved in disclosure, including the likelihood that it would encourage speculative 'deep pocket' litigation." Since 2010, Ernst & Young have been battling to recover investors cash from the demise of Heather Capital. In court documents filed in the Isle of Man as part of a negligence claim against accountants KPMG over their role in Heather Capital - it is claimed Heather Capital were operating a Ponzi scheme to dupe investors. Documents allege that as early as 2006, senior KPMG staff feared Heather Capital “may have been perpetrating a fraud”. And in August 2007, KPMG employee Raymond Gawne told a colleague that he was “very uncomfortable" acting for the fund which “may have acted in a criminal manner". The claim also alleges that millions of pounds of loans passed through the client account of Glasgow lawyer Frank Cannon who acted for Heather. KPMG senior executive David McGarry sent an email to Gregory King stating: “Frank Cannon has been uncooperative, either in providing some form of explanation for all of the security documentation prepared by his firm, or in agreeing to facilitate access to Cannon’s clients’ money account". In July 2011, the Scottish Crime & Drug Enforcement Agency obtained search warrants to recover material from the Glasgow based Cannon Law Practice – run by Frank Cannon - as part of an investigation into the alleged embezzlement of millions of pounds of cash. Much of the allegedly stolen money passed through Cannon's client account. 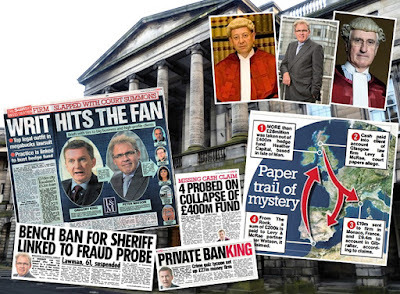 The move by Police followed a financial audit of Cannon’s Law Practice - conducted by the Law Society of Scotland in 2010, during which it was discovered millions of pounds had passed through Cannon’s client account in relation to a series of offshore transactions involving their client - Gregory King, a director of Mathon Ltd & Heather Capital. It is unknown at this time if the Law Society of Scotland have conducted any financial audit of law firms mentioned in the latest court proceedings – where it is alleged tens of millions of pounds have passed through client accounts to offshore companies. A report from Police Scotland naming Gregory King, Andrew Sobolewski, Andrew Millar & Scott Carmichael is still being considered by the Lord Advocate Frank Mulholland & Scotland’s Crown Office. However, no decision has yet been made public on the case since the Crown Office confirmed it was considering Police reports filed with prosecutors some time during 2014. Peter Black Watson (61) – a partner in Levy & Mcrae at the time of the transactions - was suspended from judicial position of Sheriff by Scotland’s top judge Lord Brian Gill earlier this year - after an investigation by the Scottish Sun newspaper prompted the Lord President to demand sight of a multi million pound writ against Glasgow law firm Levy & Mcrae. As no register of interests for members of Scotland's judiciary currently exists, top judge Lord Gill was unaware of Sheriff Watson’s involvement in Heather Capital until the Scottish Sun newspaper contacted the Judicial Office directly. A statement from the Judicial Office for Scotland read: Sheriff Peter Watson was suspended from the office of part-time sheriff on 16 February 2015, in terms of section 34 of the Judiciary and Courts (Scotland) Act 2008. The Lord President’s Private Office immediately contacted Mr Watson and he offered not to sit as a part-time sheriff on a voluntary basis, pending the outcome of those proceedings. Mr Watson e-mailed a copy of the summons to the Lord President’s Private Office on Saturday 14 February. Watson – who remains suspended from the judicial bench, was a director of Mathon Ltd - a key part of the Heather empire. The suspended Sheriff who now works out of PBW Law, also held shares in Aarkad PLC - a company based in the Isle of Man which channelled money into Heather Capital. Watson was also a director of a “King & Company” – a Private Bank set up by Gregory King in Gibraltar. However, Gibraltar’s Financial Services watchdog revealed the banking license application for “King & Company” was withdrawn after two years in 2010. In his capacity as a solicitor, and during the time Watson acted as a Sheriff – his clients included former First Minister Alex Salmond, former Rangers owners Sir David Murray, ex-Glasgow City Council leader Stephen Purcell and former Lord Advocate Elish Angiolini. Heather Capital Ltd (‘HC’) was incorporated in the Isle of Man in 2005. Prior to its liquidation in 2010 it had received investments exceeding $400 million. The present action has been raised in its name by the liquidator. The first defender is the firm of Levy & McRae. The other defenders are eight individuals, who were partners in the firm in the period from 1 January 2007 to 31 December 2008. The liquidator contends that the company was defrauded of a sum of about £90 million. The scheme involved the transfer of funds to companies incorporated in Gibraltar that were owned or controlled by one of HC’s directors, Gregory King. A firm of solicitors in Gibraltar, Hassans, acted in these transactions. According to the liquidator, in early 2007 HC’s auditors raised queries about these transactions. Subsequently, Mr King sought to conceal their true nature. One of the transactions concerned a company called Westernbrook Properties Limited. On 4 January 2007 the sum of £19 million was paid into the first defender’s client account. It was paid out 5 days later to an account with HSBC Private Bank in Monaco held by a Panamanian company. On 24 January the sum of £9.412 million was paid into the first defender’s client account. It was paid out on 28 March to the client account of Hassans. On 23 December 2008 a payment of £200,000 was made to the eighth defender, Mr Peter Watson, from Hassans’ client account. The liquidator pleads that HC was the client of the first defender at the material time. Accordingly, the defenders owed HC certain fiduciary duties, together with an obligation to exercise the knowledge, skill and care of reasonably competent solicitors. The liquidator seeks to recover the sum of £28.4 million from the defenders. He intimated the claim on 23 June 2013. There followed extensive pre-action correspondence before the summons was served on 23 October 2014. During that period, the liquidator did not request clarification of the membership or constitution of the firm of Levy & McRae as it existed from time to time. The summons called on 10 February 2015. The defences were lodged a week later. They stated that three of the defenders had been wrongly convened, because they had been assumed as partners after June 2007. They are Mr Alasdair Gillies (1 July 2007), Mr Andrew Sleigh (1 December 2008), and Mr Gary Booth (1 January 2011). The defenders raised this matter at the preliminary hearing on 5 March, and the continued hearing on 8 May. They said it involved significant reputational damage to those three individuals. They asked for early disposal of this discrete issue. I fixed a hearing to take place on 13 August. About a week before the hearing, the liquidator enrolled a motion to allow a minute of amendment. It sought to add five further individuals as defenders, on the footing that they had been partners in the first defender in the period from 4 January 2007 to date. The defenders have failed to provide any of this information to the pursuer. The pursuer has identified a further 5 current and former partners of the firm who require to be convened. He suggested a number of other relevant facts and circumstances. They included whether the new partner had made a substantial capital contribution, whether he had paid or acknowledged any of the prior debts, and whether separate accounts were kept for the new and the old firm. Lord Hodge determined at paragraph  that the appropriate test was whether a new partner had “accepted liability either expressly or tacitly” for the claim. Who is responsible for averring those facts and circumstances? The answer is clear. In Thomson Balfour v Boag & Son 1936 SC 2 Lord Fleming stated (at p16) that “it was for the pursuers to prove” that a new partner had accepted liability for the debts of the old business. In my view, that averment fails to satisfy the test identified by the Inner House. There are no averments that would allow the liquidator to lead evidence that the three individuals either expressly or tacitly agreed to take over the existing liabilities of the previous firm. It does not set out the basis upon which the three individuals are convened. Instead it inverts the normal rule that the pursuer must plead his case. Given the serious nature of the allegations and the size of the claim, the liquidator required to identify the basis upon which each defender had been convened. He also had to differentiate between the acts of those individuals who had been partners at the material time and those who had been assumed after 2007. I shall therefore sustain the defenders’ first plea-in-law to the extent of dismissing the case, so far as laid against the third, sixth and seventh defenders. In the minute of amendment, the pursuer seeks (a) to alter the dates for the partners called as defenders to 4 January 2007 to date; and (b) to add five individuals, all of whom have been partners of Levy & McRae at some stage in that period. The relevant dates are as follows: Anne Bennie (2000 – 2008), Calum Anderson (1 July 2014) Laura Salmond (3 November 2014), Graham Craik (5 January 2015), and Stephen Hay 2007 (c6 months in late 2007). The minute does not include any substantive averments to indicate the basis upon which these individuals are said to have taken over prior liabilities. Accordingly, for the same reasons as given in relation to Messrs Gillies, Sleigh and Booth, I refuse to allow receipt of the minute. The pursuer has had ample opportunity to investigate the position. Standing the very serious nature of the allegations, and the absence of a proper basis for seeking to add the five individuals as partners, I hold that it is not in the interests of justice to follow that course. The pursuer seeks an order requiring the defenders to answer questions about the insurance position. First, will the policy cover the claim? Second, have the defenders notified a claim to insurers? Third, have the insurers accepted the claim? At the May hearing, the pursuer’s then senior counsel accepted that he was not entitled to ask for that information. Lord Davidson, however, explained that the application had been made to elide the difficulty of identifying the correct defenders. If the claim is covered by insurance, then that issue is much less important. In XYZ v Various  EWHC 3643 (QB) Thirwall J ordered very limited disclosure to demonstrate that the defendant had sufficient insurance to fund its participation to the end of the trial. The Court of Appeal has indicated that the matter is not free from doubt: Dowling v Griffin  EWCA Civ 1445. Lord Davidson suggested that I could use the wide powers contained in rule of court 47 to order disclosure. I decline to do so. The details of insurance are a private matter between the insured and insurers. There are major questions involved in disclosure, including the likelihood that it would encourage speculative “deep pocket” litigation: West London at . I shall allow a further period of ten weeks for open adjustment, with the qualification that all substantive adjustment should be completed within eight weeks. That lengthy period is justified by three factors. First, there have been recent extensive adjustments to the pleadings. Second, a hearing is due to take place before the Supreme Court of Gibraltar on 24 September in respect of a Letter of Request to recover the files of Hassans. Third Lord Tyre has reserved judgment following a recent debate in similar proceedings raised by the liquidator against Burness Paul. Mr Clark said that the decision may have a significant bearing on the present action, as the arguments on prescription and loss are very similar. Having regard to that third factor, I shall also fix a diet of debate. Mr Clark estimated that it would last three days. Apart from the plea of prescription, the defenders mount eleven separate challenges to the relevancy of the pursuer’s averments. If the defenders are successful and obtain dismissal, that may save each party a considerable sum of money. Mr Clark estimated that a proof before answer would last about six weeks and cost each side several hundred thousand pounds. The pursuer asks the court to ordain Mr Watson to provide a witness statement to explain the circumstances in which the sum of £9.5 million was paid to Hassans and the purpose of the payment of £200,000, made to him from Hassans’ client account on 23 December 2008. The pursuer seeks the statement to make his own averments “more pointed”. I would be slow to order one witness to produce a statement in advance of the other statements. I find no compelling reason in this case to depart from the normal rule that there should be a simultaneous exchange of witness statements. I therefore refuse the application. Roll on a register of interests for judges! Have you seen the write up from Brodies on this case? the liability of new partners for the existing liabilities of the partnership. An action seeking damages of £28.4 million was raised by the liquidator of Heather Capital Ltd (“Heather”) against that company’s former legal advisers, Levy & McRae. Included with Levy & McRae as named defenders to the action were a number of individuals who were said to be partners in Levy & McRae in the period 1 January 2007 to 31 December 2008. The liquidator contended that Heather was defrauded of around £90m as a result of a scheme to transfer funds to companies incorporated in Gibraltar, all of which were owned by one of Heather’s directors, Gregory King. Various transfers of money are said to have passed through Levy & McRae’s client account. Heather’s auditors raised queries about these and other transactions in early 2007 and it was said by the liquidator that Mr King sought to conceal their true nature. Heather was a client of the defenders at the material time. The liquidator argued that Heather had suffered loss and damage by reason of the defenders’ “dishonest assistance of Gregory King in the latter committing breach of his fiduciary duties owed to the pursuer”. The Defences lodged on behalf of the defenders stated that three of the named individual defenders had been wrongly convened as defenders because they had been assumed as partners after June 2007. The hearing was at a preliminary stage dealing with a number of legal issues before evidence had been heard. Most professionals, if they have it, arrange their indemnity insurance on an individual basis. So, while it is common knowledge that solicitors and other professionals will have indemnity insurance in place, the identity of the insurer, the level of cover, self-insured or excess amount among other things are not readily ascertainable by third parties. Even in cases where it is compulsory to have cover in place, such as solicitors in Scotland, details and the extent of cover can vary. It is easy to see why a claimant would want to know, before incurring significant litigation costs, whether a defender will have cover in place to meet that claim. Are they entitled, however, to require the defender to disclose that information? The liquidator, on the basis that the information was required to assist in identifying the correct defenders, asked the court to require the defenders to disclose (1) if there was adequate insurance cover in place to meet the claim if successful; (2) whether the claim had been intimated to the defenders’ insurers; and (3) whether the insurers had accepted the claim. A similar approach was taken in England & Wales where in West London Pipeline & Storage Ltd v Total UK Ltd, the judge refused the claimant’s request for an order for disclosure of insurance details under CPR Part 18. Prior to raising proceedings, the liquidator had not requested clarification of the membership or constitution of Levy & McRae as it existed from time to time. When Defences were lodged, it was said that the action should be dismissed against three of the individual partners named as defenders on the basis that they had not been partners of the firm at the material time and so were not liable for anything done before they became a partner. It was argued that the question of liability or otherwise of the three defenders should be determined at the earliest opportunity because the raising of proceedings against them had caused “significant reputational damage”. “A person who is admitted as a partner into an existing firm does not thereby become liable to the creditors of the firm for anything done before he became a partner”. The presumption referred to was said not to arise unless there were facts and circumstances which brought it into play. Those could include the level of a new partner’s capital contribution; whether the new partner had paid or acknowledged any of the prior debts and whether separate accounts were kept for the new and old firms. The liquidator had also sought to amend his pleadings to add a further five individual partners of the firm as defenders, all of whom had been partners of Levy & McRae at some point between 4 January 2007 and the present time. Lord Woolman again refused the motion to allow the amendment on the basis that the liquidator had failed to show that any of the partners had assumed the liabilities of the partnership when they joined. This decision suggests that defenders are not obliged (and will not be compelled by the court) to disclose details of any professional indemnity cover in place without a contractual obligation to do so. Anyone considering entering into partnership should carefully consider and take advice upon whether, in doing so, they will be assuming not only the assets but also the liabilities of that firm. The most prudent course of action is to expressly set out in the partnership agreement whether (or to what extent) a new partner is assuming any of the firm’s prior liabilities. No register of interests means Scotland's top judge can turn a blind eye to anything he likes until a newspaper calls his office..
My former law firm was audited by the LSoS for transferring around £16k to a French bank.The tip came from a rival solicitor.The audit plunged us into crisis and business conveniently swallowed up by friendly LSoS face.Here £30m goes and? Try coming out with that remark in a US Court. It should not go unnoticed this also relates to a member of the judiciary.. I will not comment directly on what you write however I have a fair idea of what is going on in the background.Good to see it in the open. The Master Policy of the Law Society of Scotland is involved in this case.Lead law firms to the insurers RSA & MP are listed in those representing the defenders. Regarding the Brodies report - it is not a surprise to see law firms who are required by the Law Society of Scotland to pay into the same PII arrangement - backing a judgement refusing further disclosure. With regard to a number of unpublished comments, views & information are noted for further reference and investigation. Could this comment be considered to be in the interests of Insurance Companies into keeping the quantum of claims artificially low, as compared to other states? Maybe a Register of Interests would clarify whether or not Conflicts of Interests exist? Couldn't possibly have Scottish lawyer's Insurers paying up and Scottish lawyers paying higher insurance premiums. So much for Equitable Grounds in Scotland? I agree re Swinney's remarks on Mill.A pity it was based on a particular case!